Oliver (Mike) Jackson is a Glaswegian born and raised. 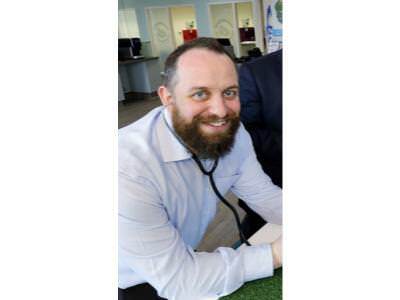 He was a late starter in veterinary terms; deciding at the age of 18 that he would switch his University place from the (Human) Medicine course into the Veterinary Medicine course and he has never looked back! Mike qualified from Glasgow University Veterinary School in 2004 and headed down to London where he spent a number of years working in Small Animal practice – initially in a large group then in some excellent smaller practices. As a recent-graduate Mike focussed on an interest he had developed at University - exotic medicine and surgery, specifically reptiles and was considering a career based in that specialty when a call from his old pals back in Glasgow (with an offer of partnership) brought him ‘back up the road’. Over the intervening eight years Mike has developed a passion for Practice development, management, marketing and design. He and his partners have taken their original small but busy practice with just seven members of staff to the West of Scotland’s largest independent veterinary group. The Pets’n’Vets Family is structured in the classic hub and spoke model with the Roundhouse Veterinary Hospital at it’s centre. Mike will very proudly tell you that he and his partners have designed every one of their practices themselves - the Roundhouse Hospital being his proudest achievement so far- having won a prestigious BVHA President’s Award in the seriously competitive 2017 Design Awards competition. At home Mike isn’t allowed any reptiles (his wife, Vicky said ‘no!’), instead, he fills his time walking his rescued French Bulldogs, tinkering with his modern-classic car, playing dominoes with his three daughters and dreaming of new Veterinary practice designs and concepts.